The corn starts here out at the field. I usually stop by wherever they are picking a few times a week just to make sure everything is up to par in terms of food safety. This is called a mule train, and it is an incredibly efficient set-up. I wasn’t able to get a good picture of this apparatus because the workers are not too keen on having their picture taken. This mule train is essentially a tractor with two “wings” like an airplane. Workers follow the wings to harvest the corn by hand. They then throw the corn up into the “wing” where packers put the corn into crates. The crates are then stacked on the truck that is towed behind the mule train. 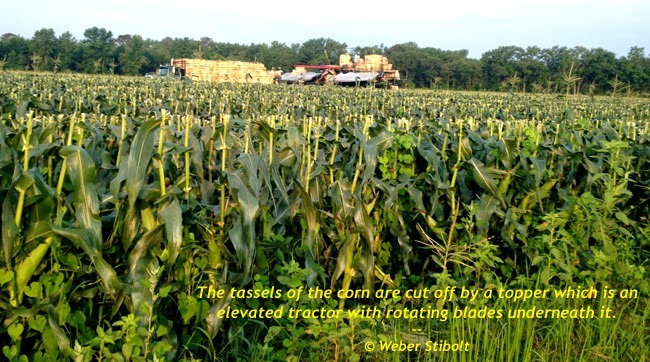 A cornfield shorn of its tops is being hand-picked by people walking behind the mule. Note: Usually there is just one ear per stalk, or maybe two. Once the truck is full, it disassembles from the mule train and arrives here at the packingshed where I work. The corn is unloaded onto the dock of the packingshed and awaits labels. I’ll get more into these labels in my next post. A field truck is ready to unload at the packingshed. The crates of corn are strapped to pallets. 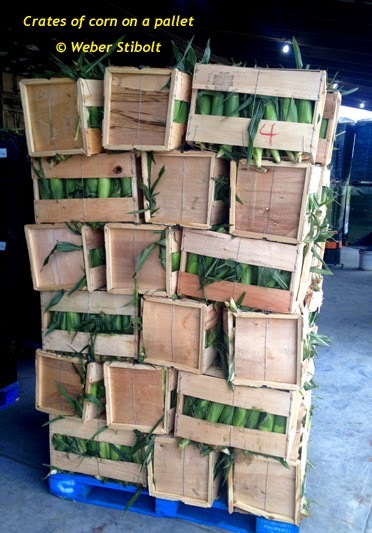 These are the pallets of wood crates filled with fresh corn. There are usually 18-20 pallets on each truck that comes to the packingshed. Each pallet has around 42 crates and each crate has around 48 ears. On a typical day, we can see 5-7 of these trucks - it’s a lot of corn! 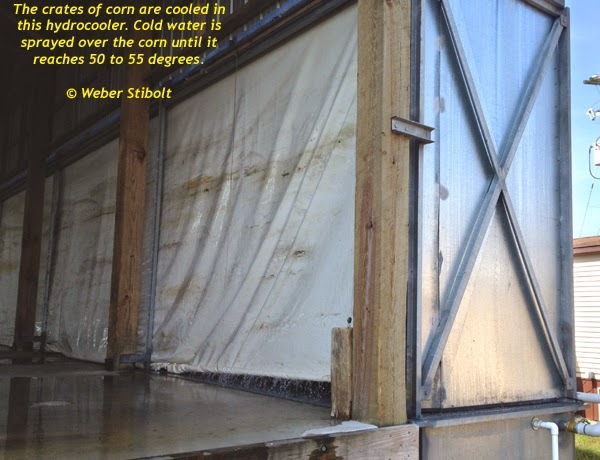 Once the corn arrives at the packingshed, it has to be cooled down. When the corn has been sitting outside in 90-degree weather, the heat that is left in the corn can cause it to spoil quickly. The corn is in this cold water bath for around 50 minutes to an hour to get the internal temperature to 50-55 degrees. Corn is cooled with cold water and once they are cooled, they must be refrigerated. After the hydrocooler, the corn is loaded into refrigerated tractor-trailers to get shipped all over the east coast - even all the way to Texas! 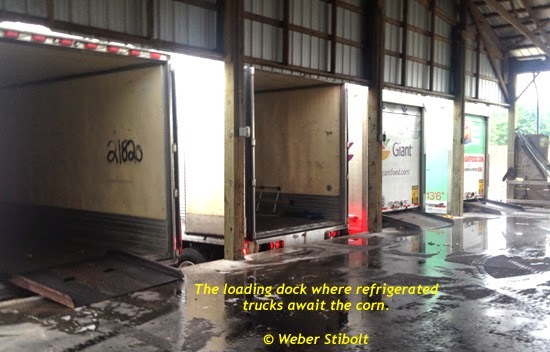 The corn is quickly transferred to these refrigerated trucks after cooling. In my next post, I’ll be going more in-depth about my role in all of this as a Food Safety Officer, and I’ll show you a bit more of what goes on behind-the-scenes.